For the past eight years, I have worked as a fashion and art photographer, freelance magazine editor/journalist and I am the founder of several independent magazine titles under the brand PROJECT TEN. I am based in the UK. 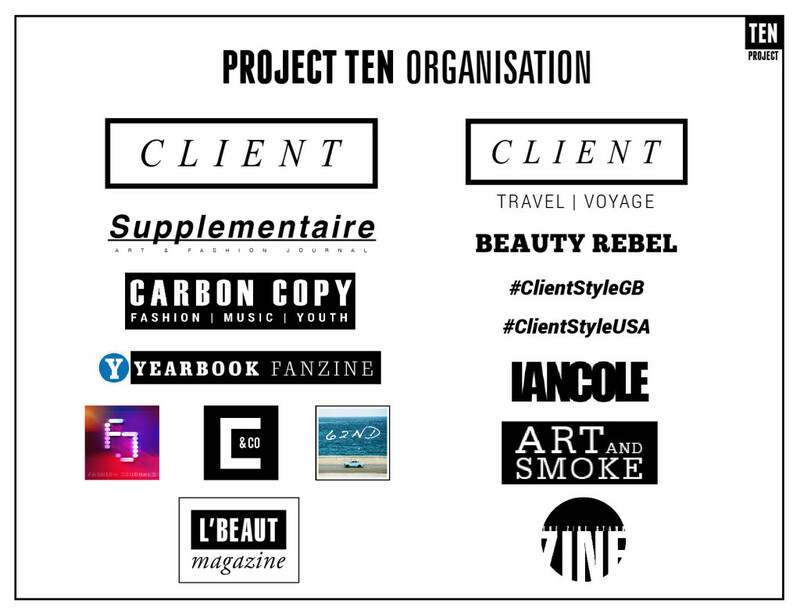 Project Ten publishes magazines, books, zines and digital editions In the genres of fashion, photography and art plus casting, development and travel. In publishing, I am probably best known for being the founder and editor-in-chief of Client Magazine, a leading independent British menswear magazine, since 2010. I recently launched a major new project under the CLIENT brand; an authentic travel magazine called Client Voyage which has been in development for over two years. I am also in the Top 5% of contributors in London on TripAdvisor. Over the past six years I have overseen and published over 150 magazines, books, printed zines and digital editions, featuring both emerging and established photographers, stylists and models (view my publishing catalogue). I have also developed and operate several fashion and art websites and multiple social media platforms, reaching over a million people each month. Client Magazine’s Facebook page is the largest, with a verified page of over 100k followers and over 49k on Instagram. On a day to day basis, I produce rich content for all of these projects, whether that be via photography, production, casting, graphic design and art direction. I would describe myself as a hard-worker and a creator. I was self-taught and I like to create things, from scratch, with what’s at hand and I love projects I can get passionate about. When it comes to art & photography (and life), I am a purist, and I don’t appreciate people who cut corners or who do not stay true to an idea. As a photographer, my approach is very creative and open-minded and I like to experiment with primitive methods. Natural and alternative light sources are preferred but if you look through my work, I have no creative bias. I do all the post-production on my own work, which I feel is part of the process. Originality, integrity and a strong work ethic are very important to me. I work with Leica & Nikon cameras and I am available for freelance assignments as photographer, journalist and editor.